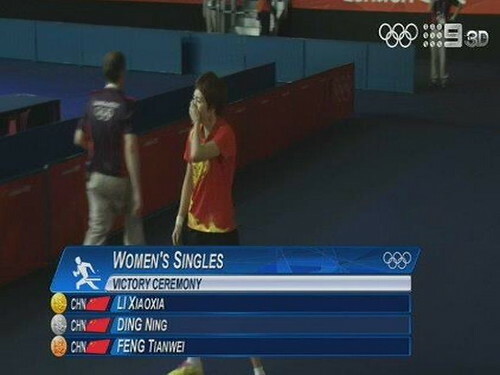 First of all, my congratulations to Feng TianWei for clinching the Bronze Medal in the Ladies Table Tennis Singles Competition, 2012 London Olympic Game. I congratulate her achievement as a person, regardless of nationality. I thank her for putting Singapore on the score board. 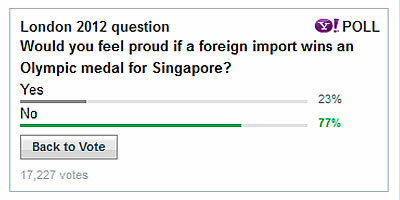 But I would stop short of hailing it as a great Singapore achievement. Some folks said that our one true medal was the silver won by Tan Howe Liang back in 1960. Yet others said that he too was a foreign import from Ch1na then. I agree with the former on one single point. Tan Howe Liang is still with us in Singapore. If anyone remembers Jing Junhong, she made good and call Singapore her home after retiring from table tennis. As far as I am concerned, she is one of us regardless of her place of birth. Today, after hanging up her paddle for almost 10 years, she continues to serve as the deputy coach of the ladies table tennis team. This is what we really want when we import foreign talents. The medal is just one of the goals that we set up to achieve but it's the short term one. The other longer objective that we want to accomplish is the "transfer of technology". The whole idea of importing is the raise our domestic standards until a time when we can be self reliant to produce our own superstar. Then perhaps we can export our own talents to other countries to do the same for them. Still, a medal is a medal is a medal. The only difference is that one is earned and one is bought. It looks the same but I am sorry to say the I do not feel the same. Think Chelsea. Think Manchester City. This is quite a difficult entry to write in the sense that while it may be belittling Feng's bronze, her efforts must still be acknowledged. Perhaps the hurt from Egmar Gonclaves still smarts till this very day when he threw his Singapore citizenship right back at our faces. So again to Feng Tianwei, I congratulate her for her bronze medal. I have the proverbial champagne to celebrate but I am going to keep it on ice until a time I am convinced she is one of us. For now, she is moving in the right direction at the time of writing this. I hope to see her at the finish line. Arrenn: I am unable to verify if the screen capture is authentic. Regardless, it doesn't really matter nor changes anything that I have to say. It was funny more than anything else.